Welspun believes it needs to be the agent of change while continuing to strategically grow its business and support its communities. Welspun is an environmentally aware company whose textiles adhere to Global Organic Textile Standard (GOTS) certification, requiring the evaluation of its entire supply chain based on stringent ecological and social requirements. Select Welspun sleep systems carry asthma & allergy friendly® Certification to indicate that they meet strict standards for controlling allergens. A social media listening study of 4.5 million consumers found that health and wellness is top of mind for textile shoppers. Consumers, particularly Millennials, strive to live a healthier lifestyle and with the rise of allergens in our environment, parents are searching for the right product for their children. The terms “hypoallergenic” and “natural” are loosely defined across all product categories and, therefore, have lost credibility with consumers. Consumer needs are changing so Welspun needed to innovate in the areas of organic and sustainable textiles. Welspun products seek to provide products to lead healthier lives, beginning with enhancing sleep quality to allow for more restful sleep. Understanding that many consumers in this category are concerned about the credibility of anti-allergen claims, Welspun pursued asthma & allergy friendly® Certification to give consumers peace of mind and confidence in their choice of mattress pads, comforters, pillows and sheets. The asthma & allergy friendly® Certification is critical to conveying credibility to the consumers of Welspun’s products, giving them the confidence that they meet strict standards for controlling allergens and, as such, are well suited for those with asthma and allergies. Consumers, particularly moms and millennials, strive to live a healthier lifestyle are increasingly dedicating more of their disposable income on products that focus on their health and lifestyle needs. 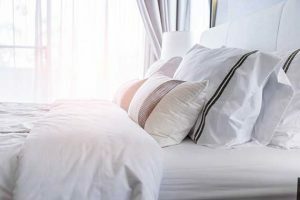 Welspun partnered with retailer JCPenney to launch a new mattress pad and bedding made without the use of chemicals – a rarity in the category – in April 2018, to benefit those affected by asthma and allergy. Prior to launching its new asthma & allergy friendly® certified bedding, Welspun conducted numerous country-wide consumer usage studies and received positive feedback about the breathability of the fabric as well as the comfort and durability. Welspun’s patented Nano Core™ bedding system has also recently become Certified asthma & allergy friendly®. Welspun is actively engaging and communicating with its retail partners about the importance of certifications for consumer purchasing confidence and their health-focused priorities. Welspun is continuing to work on new product launches to expand its asthma & allergy friendly® certified footprint. Welspun is advancing its leadership position around the benefit of third-party certification and transparency across its global supply chain, in addition to driving community-focused efforts tackling health and the environment, sustainability, education and the empowerment of women.